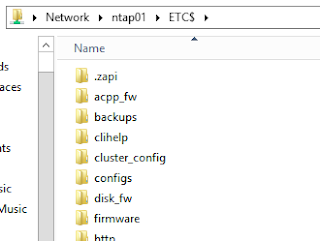 NetApp FAS/V-Series controller has DNS configured. 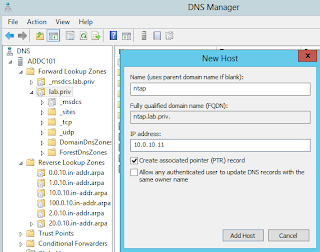 1) Verify the correct domain, and correct nameserver(s) are configured on the Filer. If the time difference between the filer and domain controller is more than 5 minutes, authentication will fail! In order to create an Active Directory machine account for the filer, you must supply the name and password of a Windows account with sufficient privileges to add computers to the LAB.PRIV domain. The user that you specified has permission to create the filer's machine account in several (4) containers. Please choose where you would like this account to be created. It is highly recommended that you create the local administrator account (NTAP\administrator) for this filer. This account allows access to CIFS from Windows when domain controllers are not accessible. Currently the user "NTAP\administrator" and members of the group "LAB\Domain Admins" have permission to administer CIFS on this filer. You may specify an additional user or group to be added to the filer's "BUILTIN\Administrators" group, thus giving them administrative privileges as well. Note 1: We chose multiprotocol filer, even though the recommendation was for NTFS only, since multiprotocol filers tend to be more common in practice. Note 2: We purposely declined adding a user/group in addition to the “LAB\Domain Admins” etcetera, to demonstrate how to add these in later. Now our storageadmin can do a RUN> \\NTAP\ETC$ or map a drive to \\NTAP\ETC$ without recourse to needing different credentials. Note: cifs lookup DOMAIN\user is a handy command for verifying the domain account exists and also for obtaining the SID.